Pasta salad… what’s the best thing about it? How easy it is to make! Oh yah, it’s also good, liked by most, and a nice cool delicious dish! 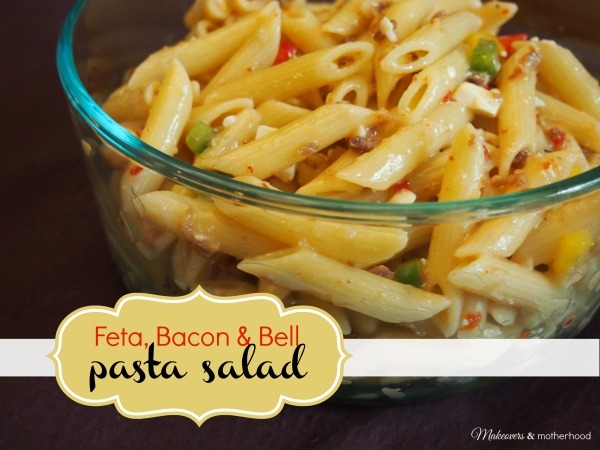 So if you love pasta salad, you’ll love this Feta, Bacon & Bell Pasta Salad! Prepare pasta according to directions on box. Drain pasta, rinse thoroughly. Place in a large bowl. Chop peppers and add all ingredients to pasta. Stir well. Refrigerate. Yes, it’s really that easy! And the tangy, yet savory flavor is sure to be a hit with all the hungry bellies at the table. Want more pasta salad recipes and some great side dishes? Check out these 10+ Totally Awesome Summer Side Dishes!